The last Thursday of every month, 8pm at the Spill. All welcome! Interested in the slam but not feeling confident enough to compete yet? Been slamming for a while and wanting to push yourself to a new level or take a new approach? Starting in October, the Peterborough Poetry Collective will be offering a workshop space on the second Thursday of the month from 5-7pm at the Spill. We've talked about the need for this space for a long while, so we're stoked to finally be offering it. Bring your writing or just a blank notebook. The workshop will be spent on whatever participants need: writing exercises, practice on the mic, feedback on poems, performance tips. Let’s share our expertise and support one another in the challenge of writing for performance! This month the workshop will be facilitated by Ziy. The workshop will be followed by a Peterborough Spoken Word Collective meeting. All are invited to attend. The next slam is on Thursday, October 25th. The regular slam is back, the last Thursday of every month at the Spill Cafe in downtown Peterborough. Sign-up starts at 7:30 and the slam is at 8pm. Cost is $5 or PWYC. ALL are welcome. We have lots of great features lined up for the season. We'll keep you posted month to month. And we'll be posting scores here too. 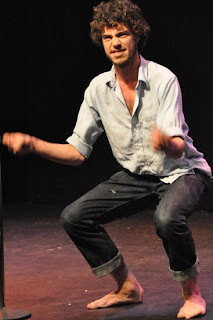 If you do wanna connect at facebook, we're Peterborough Poetry Slam. With the success of the last Peterborough Slam, the Poetry Collective hopes to keep the ball rolling with a change of venue and theme. We encourage all poets to come showcase their material either in the open-mic or the slam format. 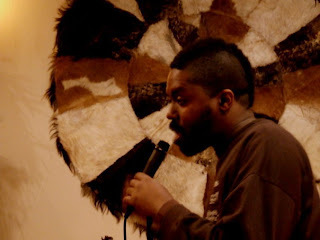 This Black History Month edition of the Peterborough Poetry Slam will feature Toronto veteran Dane Swan who has featured in more than a dozen North American cities and competed in numerous poetry slams, including the Canadian Festival of Spoken Word (placing 2nd) and the Rust Belt Regional Slam (placing 3rd), with the Toronto Team. In addition to his live performances, Dane has published anthologies of his work and contributed to various CD projects. The fiery battle of words will be followed by a fireshow presented by PyroFlys Circus which is certain to awe and amaze the audience. To really give this slam a change of scene, we will be ending the night with some music and dancing with our good friend DJ Mario Roldan, so come give us what you got! The latest instalment of the Peterborough Poetry Slam will determine who will be representing Peterborough at the 2nd Annual Vancouver International Poetry Festival and the 2nd Annual Canadian Individual Poetry Slam Championship on April 23rd through April 28th, 2012. The position is open to anyone who has ever previously competed in a Peterborough Slam and currently lives in Peterborough. The victor will receive a $150.00 subsidy towards travel and expenses for the trip, as well as any additional fundraising, as well as the chance to win $2,450 in prize money. To help celebrate this moment, Johnny Murdoch Macrae, the 2010 Vancouver Grand Slam Champion, a finalist at the inaugural Canadian Individual Poetry Slam Championship, and the first-ever winner of the Underground Individual Championship held in Toronto at the 2011 Canadian Festival of Spoken Word, will be the feature poet. "Although many of his poems focus on human relationships with the environment, Johnny writes about everything from riding public transit, to gender and sexuality, to the apocalypse, often shifting between funny and serious tones within the same poem. A strong believer that creative expression is self-empowering, Johnny has spent the last six years teaching improvised theatre and spoken word poetry in high schools around BC." In addition to the spinning of fiery words, the Pyroflys, who featured at the 2011 Slammiversary, will be putting on their fire show during the Slam intermission to amaze and awe the audience and onlookers. At the Peterborough Poetry Slam Finals on Saturday, only three of our competing poets were able to commit to being part of the 2011 Peterborough Spoken Word Team travelling to the Canadian Festival of Spoken Word in Toronto in the fall! Want to compete for the team? THIS IS YOUR LAST CHANCE. There is one spot left on the team, and an alternate spot who also travels/practices/performs with the team. To sign-up for the 8pm (SHARP!) slam, e-mail ptbopoetryslam@gmail.com before 7pm Tuesday May 31st. Or show up to the Cannery at 7:30 to sign-up. There will be a cap on how many spots available, so sign-up early! Bring TWO poems to compete. Max. approx. 3 minutes each. Seriously. Don't miss this, folks. What a lovely thing to do on a Tuesday evening. $5-10/PWYC for our brilliant travelling Fugitives et al. Want to see us before you see us? and live, with her guitar: "Thesaurus"
The Fugitives are the combined talents of Vancouver artists Adrian Glynn, Barbara Adler, and Brendan McLeod. A group of multi-instrumentalists, songwriters, poets and novelists, each with their own burgeoning solo career, they’ve won individual accolades as diverse as the Canadian SLAM poetry championship, CBC poet laureate, and a place in the Peak performance songwriting series. But their primary focus lies in banding together to integrate their sensibilities into a dynamic mix of modern folk. Formed five years ago on Vancouver’s East Side, The Fugitives have trod their instruments and words numerous times through Canada and Europe Performances that began in abandoned bank vaults and small vegetarian restaurants in England have turned into mainstage appearances on the Canadian folk festival circuit and sold out headlining shows at venues as diverse as the Vienna Literary Festival, the Winnipeg Fringe Festival, the Vancouver Jazz Festival, and the Chutzpah Dance Festival. Tanya Davis is a poet. She is a storyteller. She is a musician and a singer-songwriter and she fuses these elements together in a refreshing matrimony of language and sound, side-stepping genre and captivating audiences in the process. With the release of her third album, Clocks and Hearts Keep Going, in November 2010, she affirms her well-earned place in the ranks of thoughtful and hard-working Canadian Artists. Since bursting onto the Halifax music scene in 2006 with her debut, Make a List, Tanya has garnered praise from industry, audience, and peers, as well as multiple award nominations, including one for her sophomore release, Gorgeous Morning, for the 2009 ECMA Female Recording of the Year. She is a 2 time winner in the CBC National Poetry Face-off as well as the Canadian Winner of the 2008 Mountain Stage NewSong contest. In 2009, with support from Bravo, she collaborated with independent filmmaker Andrea Dorfman to produce a short videopoem entitled How to Be Alone; the short has since been featured at numerous film festivals, including The Vancouver Film Fest, The Worldwide Short Film Festival, and the VideoPoetry Festival (Berlin). It also has 1.8 million views on Youtube. Clocks and Hearts Keep Going was produced in collaboration with celebrated Artist Jim Bryson. This album, like those before it, features strongly Tanya's unique and vulnerable style, full of poignant lyrics, catchy melodies, and expressive, if unconventional, arrangements. She also recently completed a feature-length show based in music and performance poetry, as funded by The Canada Council for the Arts; it will be debuted in 2011. - Build the skills, talents and confidence of local writers and performers, and enrich the local spoken word community by providing opportunities for interaction with visiting spoken word artists.